Net oil exporter Malaysia and commodity-rich Indonesia are the two nations to suffer most from low oil prices, while Japan will likely have the greatest benefit from it, a recent study conducted by Thailand-based Economic Intelligence Center (EIC), a unit of Siam Commercial Bank, found. Malaysia, already plagued by soaring household debt and probably a candidate for a sovereign rating downgrade in the near future, relies heavily on energy and fuel as oil and natural gas exports account for around 8 per cent of the country’s GDP. Thus, low oil prices have a negative impact on Malaysia’s current account balance and currency, the EIC said. The Malaysian government’s budget is also highly dependent on regular dividends and royalties from state-owned oil giant Petronas, which account for 30 per cent of government revenue. Falling oil prices naturally reduce these payouts, raising fears of major budget cuts. Indonesia suffers indirectly. Being a net oil importer, lower prices are favourable, but the country is heavily reliant on the export of other commodities like coal, palm oil and rubber which make up 60 per cent of the country’s GDP, according to the EIC study. Prices for these commodities have been pushed down in tandem with the oil price and by increasing supply amidst a weakening global economy. On the upside, losses in commodity exports are partly compensated by lower fuel-related operating and transport costs for Indonesia’s commodity industry. “The priority for these commodity-dependent countries must be to continue to diversify their export and production base over time by increasing their overall competitiveness,” says Axel van Trotsenburg, the World Bank’s vice president for East Asia-Pacific. “Particular emphasis is required on reforms such as strengthening regulatory and legal institutions, enhancing skills and improving the business climate,” he adds. However, for most other countries in East Asia the oil price decline is highly beneficial because they are oil importers, with Japan expected to enjoy the biggest economic boost. Japan’s import of oil and oil-related products was valued at $210bn in 2014, around 4 per cent of the country’s GDP, and the decline in oil prices of more than 50 per cent means huge financial relief for the state budget. The entire manufacturing sector is set to experience a significant boost from lower raw material and electricity costs, especially the power-hungry steel, tire, glass, paper and automotive industries. The World Bank expects that Japan’s growth will recover to about 1.2 per cent in 2015 and 1.6 per cent in 2016 after a weak performance last year, with low oil prices boosting consumer purchasing power to compensate for weak wage growth and rising import costs of non-oil goods. For similar reasons, other big net oil-importers such as China and South Korea will benefit from lower oil prices. For Thailand, another net oil importer, the benefit of lower prices could mean a boost in economic growth in 2016 of almost half a percentage point. 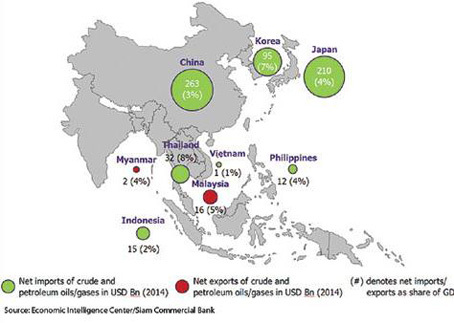 Thailand’s net oil imports stood at $32bn in 2014, and with lower prices industries such as wholesale and retail, food and beverage, as well as electronics should benefit from increased consumption, while the logistics sector can gain from lower fuel prices. But the EIC warns that Thailand’s sizeable petroleum exploration and production sector will suffer from lower revenues, the tourism industry will face lower income from fewer Russian guests and the auto industry will see decreased demand from the important Middle Eastern target markets.